Lime: when we talk about summers, lime shirt must be there. This goes perfectly with both formal as well as casual look. For a cool, casual look make sure that the length of your shirt does not exceed your waistline. Preferably, cotton shirts because they have a tendency to beat the heat. You can even go for some linen stuff – pair them with your blue denims or chinos with flip-flops or loafers. The lime shirt goes perfectly with all skin tones. Pattern: when we talk about patterns, we get many options for choosing like loud patterns or self-pattern especially in suits and blazers. But the catchy look for summers is a “smashing shirt”. Your shirt can be buttoned down, casual, or collared. On a second thought, when we talk about patterns, then there is a vast difference between loud patterns and funky patterns. Funky can be tolerable, but load is a big NO. Always prefer for neutral colors like blue, beige or white. These shades are always in. Team up your pattern shirt with chinos or denims with sneakers. You can also go for loafers, brogues with sunglasses and belt. Salmon: we all know pink is not a color for masculine men, right? But wearing a light shade of pink won't harm anyone, neither salmon color. This color has been the popular choice in sweaters, jackets and shirts. If you are confident enough to carry this color fashionably then this shade is for you! Rock it! Pair this shirt with black, white, brown, cream or dark blue denims. Classic White: white never goes out of fashion, basically, it is a symbol of class, royalty, confidence and elegance. You can style this piece of versatile for day off or in the evening, even night parties can be with the white shirt. But make sure you avoid all the white look. Sneakers and boots won't disappoint you. 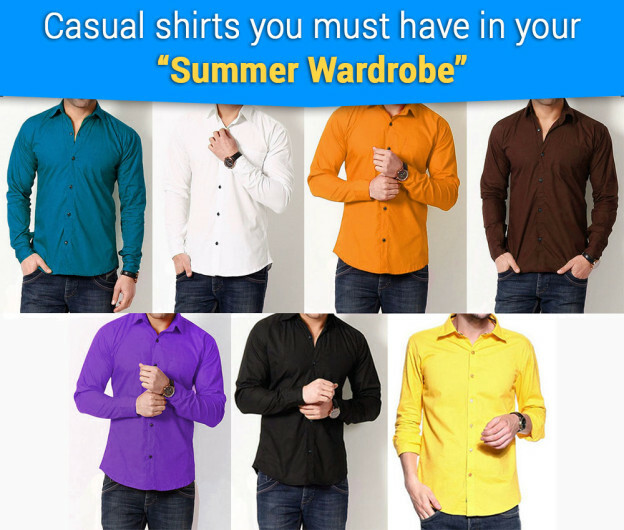 Stick with these easy shirts and you won't feel hot during summers, only if your lady says so!